‘Bad Wolf’ represents the beginning of the end, and not only for a strong opening series of the revitalised Doctor Who. It had been public knowledge since just after the positive reviews of ‘Rose’ had started coming in that Christopher Eccleston was set to leave the role. For the uninitiated, there were questions of what that would mean for the franchise going forward; for the fans, there were questions of how he would exit the role and if there would be a regeneration scene. Those questions combined with the weighty expectations of any finale and the need to start offering answers about the Bad Wolf story arc left a lot for ‘Bad Wolf’ to accomplish as the opening half of the Eccleston’s final story. ‘Bad Wolf’ makes a bold choice at the start, electing to dramatically shift the tone from previous episodes and to offer exposition through a sense of surrealist unease. Without needing to focus on the sort of extremist lengths these types of shows may progress to, the TARDIS trio inexplicably finds themselves separated and taking part in futuristic versions of reality game shows on the Game Station (or Satellite 5 as it was once known)- the Doctor in Big Brother, Rose in The Weakest Link, and Jack in What Not to Wear. On a first viewing, it’s quite disconcerting to see how these seemingly innocuous shows can be turned into the stuff of nightmares as each of the characters quickly finds themselves in mortal danger. While the relevance of these particular shows may be lost on future generations of viewers, the concept should always be intrinsic enough to enhance the perilous atmosphere even without that direct knowledge. The Doctor (with Lynda) and Jack quickly escape their shows, but Rose is not so fortunate. Following a harrowing round of The Weakest Link, the conniving Roderick proves victorious and Rose joins the long list of humans to be disintegrated for not winning. This is truly a fantastically scripted and performed moment as the realization hits both Rose and the Doctor, and the grim determination that takes control of the Doctor is truly mesmerizing to watch. While previous episodes have explored this incarnation’s moral ambiguity to varying extents, suddenly nothing is off limits, adding a further edge to his character and giving the perception that he truly does not have any boundaries. So with such great characterization and acting, the realization that the Doctor is partially to blame for the situation in general, and Rose’s loss and sudden disintegration, the only question is how the resolution and cliffhanger would set up and guide events for the second half. This is a rare instance where perhaps there is a bit too much information, but the overall result is a tremendous success. In an interesting reversal of expectations, the Station Controller ends up being on the Doctor’s side, she being the one who brought the TARDIS crew to the Game Station and hiding them in the transmissions. As she reveals the bigger threat controlling her, she is transported away to be killed by her masters, the Daleks. After such a memorable reintroduction in Dalek as well as their importance in the overall mythology of the show, it was inevitable that they would return. And so they do. With a vengeance. 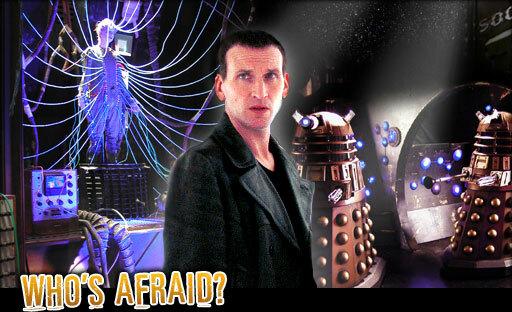 It seems a missed opportunity for continued suspense that it is revealed so quickly that Rose has also been transported to the Dalek ship; this does allow, however, for a particularly telling and standout moment for the Ninth Doctor as, even with his companion’s life in the balance and a seemingly endless number of Dalek ships looming large, he refuses to stand down and vows to rescue Rose and destroy all of the Daleks. The stakes have never been higher, and the scene is set for an explosive finale.